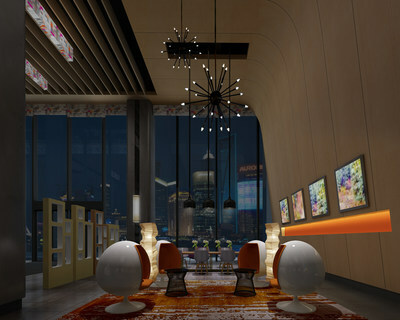 SHANGHAI, April 17, 2019 /PRNewswire/ -- Aloft Hotels, Marriott International's innovation incubator brand for global travelers, today opens the brand new 191-room Aloft Shanghai Zhangjiang Hotel, bringing high-tech, modern style and a vibrant new social scene to Shanghai as the first Aloft hotel in the city. The hotel embodies the brand's different by design philosophy which is noted for its open, social spaces that connect next generation travelers. It has 191 modern and stylish guestrooms featuring high ceilings and is equipped with keyless mobile check-in system which enables guests to utilize their mobile phones as room keys. The design-forward guestrooms, flexible for both work and play, feature the latest technology and the brand's signature offerings, such as the ultra-comfortable plush bed, walk-in shower, custom amenities by Bliss® Spa, fast & free WiFi and 43" LCD TV. 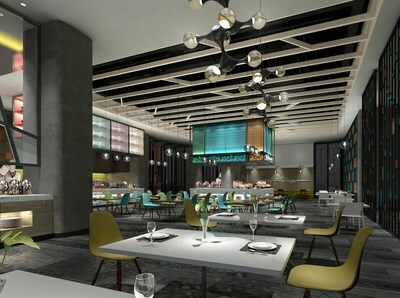 Aloft Shanghai Zhangjiang Haike Hotel is also home to a variety of dining and social spaces. The hotel's signature restaurant, Nook, serves all-day dining ranging from breakfast buffet to a la carte dishes for lunch and dinner. The restaurant can accommodate 100 guests, and also has three private dining rooms. Re:fuel by AloftSM serves up Aloft's signature 24/7 grab-and-go options ranging from light meals, snacks for every craving, healthy selections, beverages and more. The WXYZ® Bar is a vibrant bar offering signature cocktails and light bites, which doubles as a live music venue as well for the brand's iconic Live at Aloft Hotels programs. During the day, the W XYZ Bar transforms into a social space where guests and locals can hang out or catch up on work. Guests can also enjoy a good workout at the well-equipped 24/7 Re:chargeSM fitness center. "We're excited to debut the Aloft Hotels brand in Shanghai, bringing the next generation of travelers to an up-and-coming tech and innovation hub in the city. The new Aloft Shanghai Zhangjiang Haike Hotel will become Shanghai's newest social hub, where creative self-expressers can meet and mingle in a casual, friendly environment over cocktails at the W XYZ bar," said Mike Fulkerson, Vice President, Brand & Marketing, Asia-Pacific, Marriott International. "What's more, travelers and locals alike will be able to see emerging local bands at the Live at Aloft evenings held regularly at the hotel." "Our entire team is proud to be part of the first Aloft hotel in Shanghai and the first international hotel in Zhangjiang Hi-tech Park Pudong. 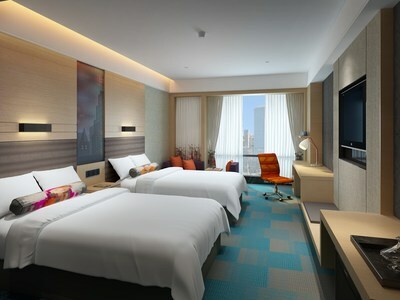 Our hotel will definitely allow value-conscious travelers in pursuit of a smart travel experience to stay connected, network, and relax in style," said Andy Shen, General Manager of Aloft Shanghai Zhangjiang Haike Hotel. With more than 150 hotels now open in 20+ countries and territories around the world, Aloft Hotels, part of Marriott International, Inc., delivers a fresh approach to the traditional staid hotel landscape. For the 'always on' next generation of traveler, the Aloft brand offers a tech-forward, vibrant experience and a modern style that is different by design. For more information, please visit www.alofthotels.com and follow along on Facebook, Twitter, and Instagram. Aloft is proud to participate in Marriott Bonvoy, the new name of Marriott's travel program replacing Marriott Rewards®, The Ritz- Carlton Rewards®, and Starwood Preferred Guest® (SPG). The program offers members an extraordinary portfolio of global brands, experiences on Marriott Bonvoy Moments and unparalleled benefits including earning points toward free hotel stays and nights toward Elite status recognition. To enroll for free or for more information about the program, visit MarriottBonvoy.marriott.com.